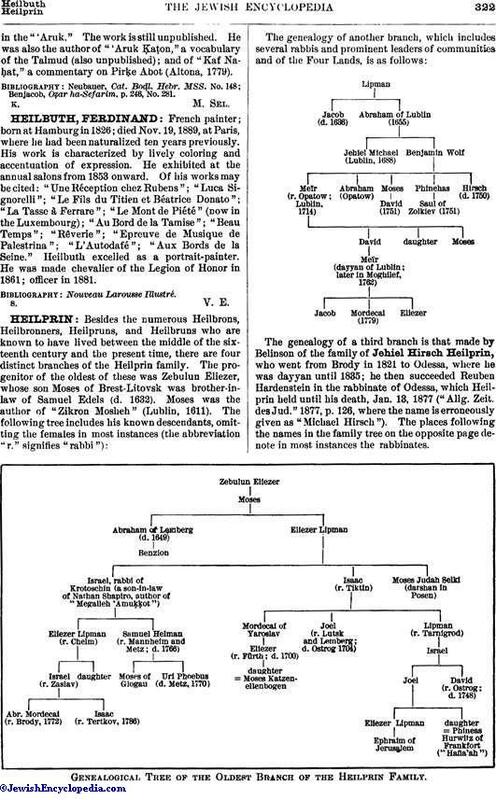 The genealogy of a third branch is that made by Belinson of the family of Jehiel Hirsch Heilprin, who went from Brody in 1821 to Odessa, where he was dayyan until 1835; he then succeeded Reuben Hardenstein in the rabbinate of Odessa, which Heilprin held until his death, Jan. 13, 1877 ("Allg. Zeit. des Jud." 1877, p. 126, where the name is erroneously given as "Michael Hirsch"). The places following the names in the family tree on the opposite page denote in most instances the rabbinates. Genealogical Tree of the Oldest Branch of the Heilprin Family. The fourth branch is that of Jehiel b. Solomon b. Jekuthiel of Minsk, author of "Seder ha-Dorot," whose son Moses succeeded him in the rabbinate, and whose grandson, Löb b. Isaac, published his work. He was probably connected with the third branch of the Heilprin family. A large number of the Heilprins now living in Russia claim descent from him. 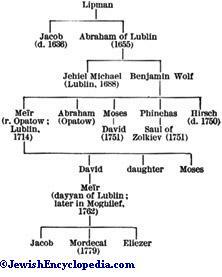 Phinehas Mendel, father of Michael Heilprin, was also probably descended from one of the several prominent Heilprins who lived in his native city, Lublin. 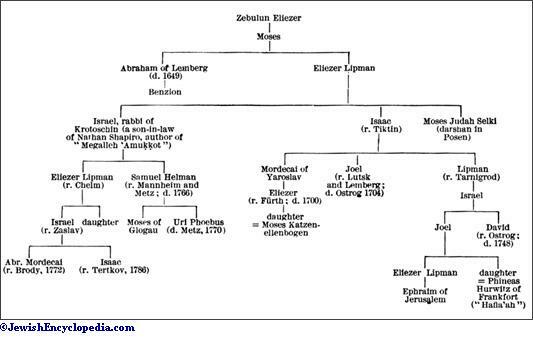 Among other Heilprins are: Abraham b. Moses Heilprin (see Heilbronn); Baruch b. Ẓebi Heilprin, author of "Miẓwot ha-Shem," on the 613 commandments (Lemberg, 1792); Gedaliah Heilprin of Minsk, author of "Ḳohelet ben Shelomoh" (Wilna, 1879); Joel b. Isaac Heilprin (Ba'al Shem I.) of Ostrog, Volhynia (1648-49); Joel b. Uri Heilprin (Ba'al Shem II.) of Zamoscz, flourished 1720; Joseph b. Elhanan Heilprin (see Heilbronn); Naḥman Heilprin, assistant rabbi ("rosh bet din") in Brest-Litovsk, 1774; Saul and Isaac, sons of Samuel Heilprin, and joint authors of "Hora'at Sha'ah" (Berlin, 1765), solutions of the difficulties left unsolved in the "ḥiddushim" of R. Samuel Edels. 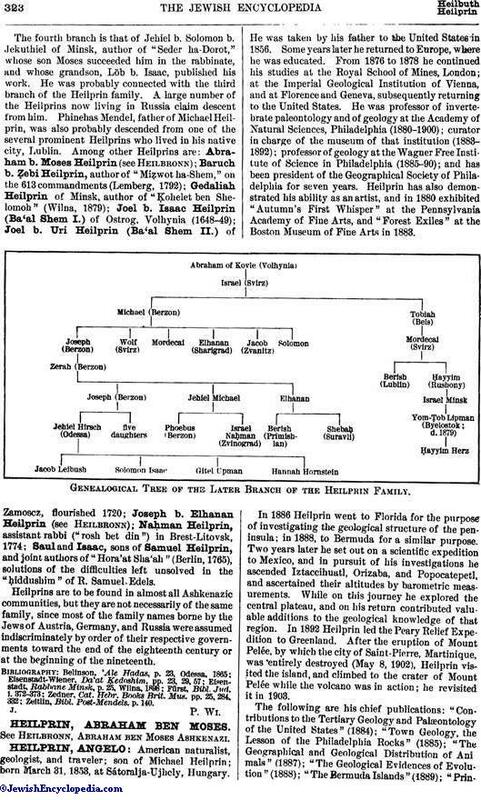 Heilprins are to be found in almost all Ashkenazic communities, but they are not necessarily of the same family, since most of the family names borne by the Jews of Austria, Germany, and Russia were assumed indiscriminately by order of their respective governments toward the end of the eighteenth century or at the beginning of the nineteenth. Zeitlin, Bibl. Post-Mendels. p. 140.